It's baaaacckk! Winter that is. Brrrrr, was it cold today, and I was happy to have quilt kits to work on and stay inside. 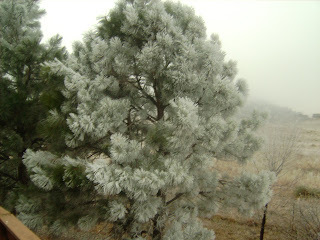 We didn't really get any snow to speak of but it seemed that a heavy cloud was just settled over the valley here and the trees all frosted up. It was really very pretty. I got a Menu Plan Monday post up over on my cooking blog. And I posted my Mexican Pork Chops and Rice recipe that I made tonight. I used some of the serrano chiles that Krystal gave me and it had quite a kick, but a tasty choice for a cold day. Tomorrow will be fun. I get to pick a project from my list of want to do's! Yaaay!